The Vancouver Chapter of CSC is presenting a discussion on the human health and material considerations in Leadership in Energy and Environmental Design (LEED) v4—the newest iteration of the sustainable project rating program. Underpass Park in Toronto won an award of excellence in the general design category for the American Society of Landscape Architects’ (ASLA’s) 2016 Professional Awards. The American Society of Landscape Architects (ASLA) selected 30 winning projects for its 2016 Professional Awards, including Underpass Park in Toronto. Underpass Park, designed by PFS Studio for Waterfront Toronto, won the award of excellence in the general design category. It stood out as a unique project because the architects took an overlooked, unwanted space and turned it into a vibrant activity hub for surrounding communities. 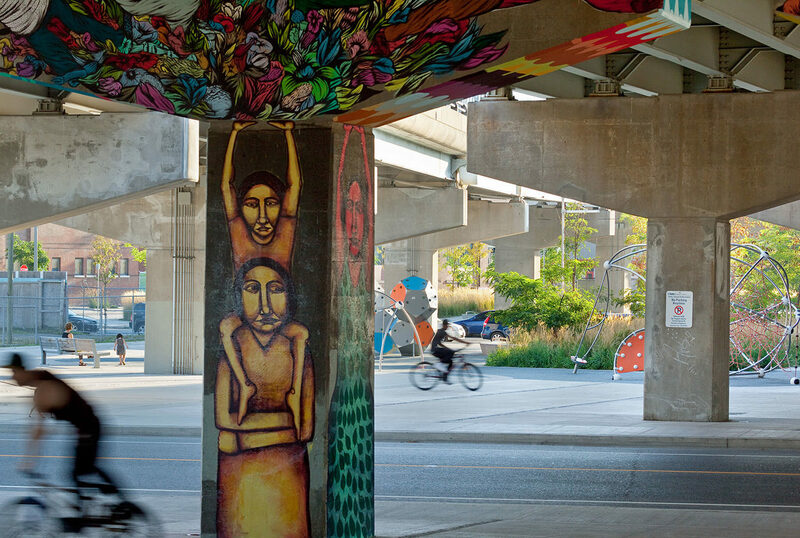 The year-round park is located beneath a complex of highway overpasses in downtown Toronto. The project was part of Waterfront Toronto’s revitalization efforts of the new West Don Lands neighbourhood. Designers turned the 1-ha (2.5-acre) space from grey to green, adding planted areas along the edges and in the voids. Plants were chosen for their ruggedness and ability to withstand harsh urban conditions. The space is mostly open for flexible activities, but a layer of multi-functional ribbon-like wall structures were added to help define various activity zones, while also providing seating and directing movement. Throughout the park there are children’s play elements, which contribute to the transformation of the space by adding colour, form, and program. Lighting plays both a functional and artistic role, with column archways lit in bright colours helping to reinvent the space at night and in-ground light-emitting diodes (LEDs) programmed to create ever-changing visual interest. Graffiti is encouraged on existing pillars to create an informal urban gallery. Underpass Park will receive its award at the ASLA Annual Meeting and Expo in New Orleans on Oct. 24.